Many of us during the course of our lives will visit foreign climbs either on business or holidays and with this in mind it is important to have an understanding of how to best secure your identity whilst in foreign countries. With identity theft now having become big business and also one of the main sources of income for organised crime gangs it is wise to ensure where possible that your identity is protected whilst on holiday even if it is in your own country. When you go on holiday your passport is the one document that will make or break your journey. If you forget to take your passport you will not be allowed to travel and likewise if you lose your passport whilst abroad you may find it difficult to travel home again. Passports are one of the identity thieves favourite documents as they contain information about you such as your name, date of birth, country of origin and also a photograph of you. Using very sophisticated methods – especially now with computers and publishing software so readily available – it can take only a matter of minutes to transform your passport into that of someone else using a different photograph and some clever editing. With this in mind it is worth ensuring that whilst on holiday your passport is secure at all times. Do not leave it in plain view of anyone other than family and if possible store it in the safe of the hotel in which you are staying. Most hotels offer this service for a few euros and if so it is certainly worth taking advantage of it. If you are going to be sight seeing and away from your hotel for a period of time do not take your passport with you. Although it may seem the safest option it is sometimes the easiest way to lose it. Most countries warn about the dangers of pick pocketing and with this in mind you should ensure that your passport is safe. Alternatively if you have other adults in your party who are not embarking on days out with you ask them to look after such documents in your absence. 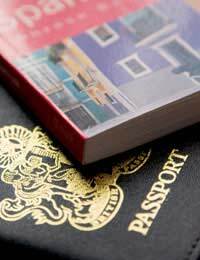 If you are working abroad for a period of time you will be issued with a work permit. This too is a very important document as you may well be asked to present it to your employer and/or local authorities whilst abroad. Again you should only carry this document with you as and when you know you will be asked for it. At all other times make sure the document is kept in a safe place. Many people prefer to drive themselves around whilst abroad so they can experience the freedom to visit sights of interest or indeed if working abroad so that they can familiarise themselves with the best and quickest route to and from work. With this in mind you will need to have your driving licence with you to prove that you are legally obliged to drive in whichever country you are visiting. If you are visiting European countries you can drive using your own licence for a period of up to twelve months. Any longer than that and you will be required by law to apply for a driving licence issued in that country. The same applies to the Americas should you wish to drive there as well. If you are unfortunate enough to lose or have such a document stolen then you should contact the local police immediately. Many people think that this practice is a waste of time but it is actually very important that you do so. In addition you should also contact your local British Consulate and inform them of the loss so they may help you find a replacement and also act as a mediator with foreign authorities and/or employers.